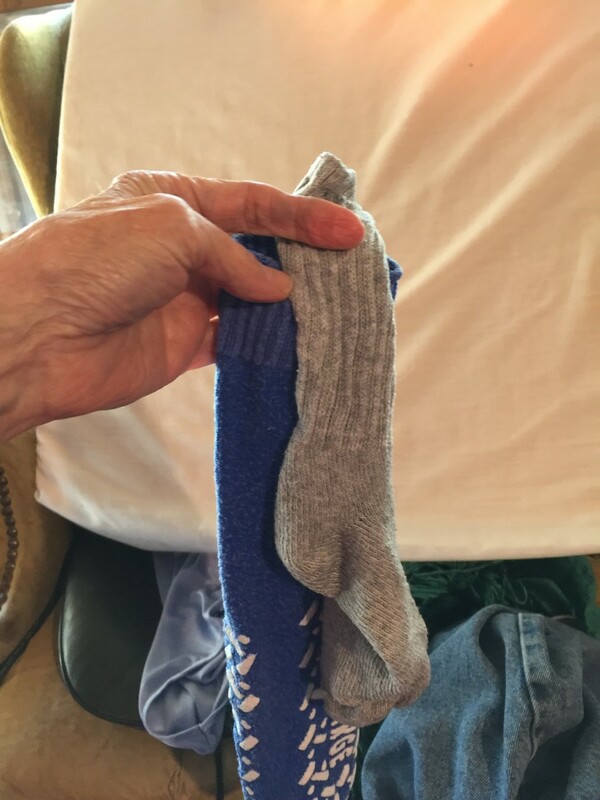 “Where do those socks go?” Mama said as she glared at the two orphaned socks in her hand. “Mama, good socks go to heaven.” Six-year-old Lewis piped up. He was standing in the laundry room door. “Lewis, now where did you get such an idea?” Mama laughed. “Tompaul told me.” Tompaul was Lewis imaginary friend. Big talk from a six-year-old, Mama thought as she placed the stray socks in what she called her “holding bag.” “Hoping bag” was more like it, she thought, because none of the family’s missing socks had ever reappeared. But his silly explanation sounded as reasonable as anything else. Today she had carefully counted five matching pairs as she placed them in the washer. She had reclaimed three matching pairs and two strays. This was getting frustrating. Very frustrating. "Oh, goody," the brothers laughed. Okay, so it's a silly piece of childish nonsense, so why did I waste my time writing it? It is based on one of my ridiculous true-life experiences, that's why. I was sitting on the bed sorting and rolling my socks when I discovered two more sock orphans. I keep my socks in a drawer built into the platform beneath my bed. I reached into the drawer and pulled out the handful of orphans I keep in the drawer. Sorting through them, I found to my chagrin that there were no mates there either, although some of them were holdover orphans from last winter and maybe even the winter before. Frustrated I pouted a silly, "Now where do those socks go? I never find them. It's like they've been raptured up!" Raptured up, socks? How ridiculous is that? Wait, there's a story in there, I thought, and I just had to write it. So I with my muse prodding my posterior with a Mary Poppins' umbrella, you know, the muse who looks like Johnny Depp and talks like Keith Richards, I began to write the conversation using the idea of the imaginary friend. I'm not sure how I had planned to end the story, but half way into the conversation between Lewis and his mother, the idea of the twin brother came tumbling out of the umbrella. Everything flowed like water from there. When I finished and read what I had written, I almost hit the delete button. Then I began to think about making it into a children's story. Maybe I will yet. I also got to thinking how futile the whole sock situation was to us who do the family laundry. I procured some soft nylon net bags, one for my white athletic socks and one for dark colors, mainly black. Each time I remove a pair of socks, I make sure that both pieces of the pair go into one bag or the other. When it comes time to wash, I place the securely zipped bag in with the appropriate color of laundry. So far I haven't lost a single sock because the bag comes out of the washer and dryer intact with all the socks conveniently packed inside. I just hope that Tompaul and Jonpaul don't catch on. Promise me that you won't tell them. Peggy, I haven't lost as many since I got the front loaders, but one of my commenters said that she had. Now I know to be more careful and always use the net bags. Thanks for reading and your cute comment. 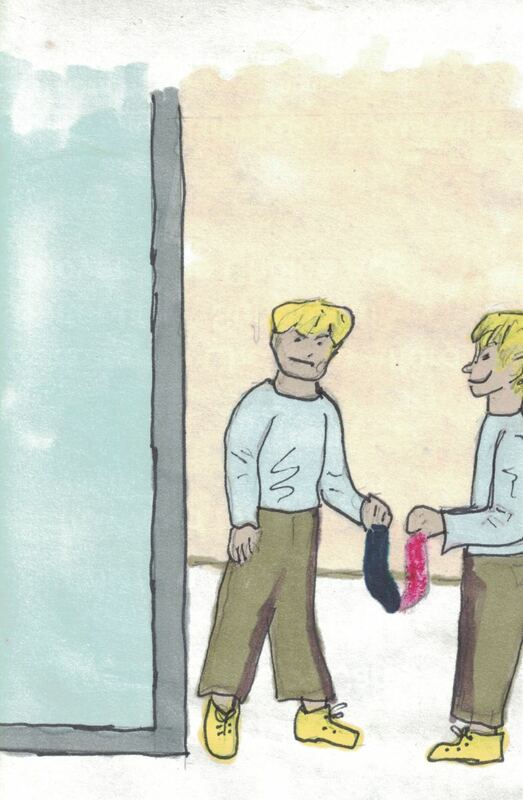 What a clever little story about those missing socks. Those mesh bags are wonderful. I promise that I will keep it a secret from Tompaul and Jonpaul. Haha! It was the old top loaders that people said allowed small items to escape somehow over the top of the tub. I'm really glad you shared your story now. I didn't think they could escape from front loaders but you've proved they can. I'll watch mine more closely now. When my oldest son was a baby in the 1960s, we had a combination washer-dryer (1 unit) that was a front loader. We bought it used, and we sold it during a move out of state. Wish I'd never gotten rid of the wonderful old thing. Thanks again. Shannon, while I deplore your trouble, I love your story. Years ago when I had a top-loader someone told me that sometimes the socks would escape from the tub. I don't know how. I now have a front loader. Which style of machine do you have? Thank you for sharing and confirming what I'd been told. Missy, what a delightful story about your daughter. Thank you for sharing. Those of us in metaphysics believe in the possibility that children with "imaginary friends" may be visited by angels or otherworldly spirits. Could it be a guardian angel checking in and playing with the child? I've always envied kids with imaginary friends. Don't mind me, I'm weird anyway. I have considered writing children's books. In fact, before my son died a couple of years ago, we had talked about colluding on some books. He was a great artist and he also had my family storyteller's imagination. His command of speaking grammar was very good, but his writing was not so great. In fact I edited a lot of his college papers before he turned them in. Anyway, I wanted his illustrations and he wanted my editing skills. But I haven't done much creative work since his death. I may get interested in children's literature again. Thank you for reading and your delightful comment. I absolutely love this story, MizB, and I relate to it so well. I keep my orphaned socks in a tote bag on a clothes rack in my room. I take it down maybe once a month, spread them out on the bed, and try to match some up. It's a good turn out some of the time. I find some lost loves in the bunch that are happy to be back together. However, it is still a crowded orphanage. As far as the imaginary friend part - that reminded me so much of my daughter when she was about 3-years-old. She had an imagined friend, and I used to be amazed, because she would act like she was really there, and everyone could see her. I'm not sure she wasn't talking to someone. Her friend's name was Flower, and I asked, my now teenage daughter, about her. She told me that she remembered her, but she's not sure her name was Flower, or if she just called her that because she wore a shirt with a flower on it? Thinking back on this conversation; I believe she was even freaked out. She wanted to stop talking about it. That's a good one, Lawrence, I dunno. In flash fiction the author doesn't have the space to analyze and explain. I guess it was because disappearing socks are one of the biggest frustrations of any mother, and they were getting off on her frustration. Does that work? Thanks for the read and comment. Really enjoyed this story, and the explanation of how the story came about, but it got me wondering why the two mischievous spirits wanted to hide the socks? Ih Natalie, glad you enjoyed it. A lot of my stories come from real life experiences. Thanks for commenting. I love this. Not only the story but also the explanation of where your story ideas come from. Ha! I'd forgotten about that. Maybe house elves are stealing our socks to buy their freedom! I think its because on Harry Potter there is that little house elf that says, 'Harry gave me a sock, so dobby free!' LOL! well there you go! That's a very good idea, Zulma. We could stuff pillows with them, too. Sometimes I use my husband's larger ones for dusting mittens. Nell, glad we have this humor in common. I would swear that I put mine in the washer, but they weren't all there when the clothes came out. Some people used to say that they got washed over the rim in the old top loaders, but I had an old Whirlpool repaired numerous times in the 25+ years I had it, and there were never socks in the body of that machine. I have a front loader now, so that excuse won't hold water anymore. Thanks for stopping by. I used some orphans socks to use as stuffing for a draft excluder I crocheted. It works a treat. LOL! Oh I did laugh! I know! Mine seem to disappear between the dryer, airing cupboard and bedroom drawers! Where oh where do they go? Hi, Paula, I know what you mean. I gave up on those decades of socks when my favorite red acrylic sock didn't show up anywhere when we moved into our house in 1994, as I'd hoped it would. It was so warm and soft and I loved that pair so much! We had a beautiful little girl kitty that loved to grab a sock and pretend it was her "baby". One day I saw her dragging that one red sock around and crying, so I gave up and gave it to her. After that I go through the orphans every few years and discard them. So far, none have come back home. Suggestion for using those old socks: cut them up into strips and make a hooked rug out of them. Wouldn't they make a soft bathmat? I don't know why I did't think of that when my mother was still alive. She would have loved doing it for me. Thanks for your comment, Girlfriend! Nothing bugs me more the mystery of missing socks!! I swear, MzB, hard as it may be to believe, I have a huge basket filled with lone socks collected over DECADES! I refuse to give up believing they just HAVE to show up at some point! It simply defies logic and common sense. I'm not giving up! One day, I'll come up with some fabulous use for all odd socks. Hang in there. I'll keep you posted. Your story makes sense to me!! Good luck with both endeavors. Actually, Robert, I have thought about it. Maybe when I finish the book I'm ghostwriting and editing for someone else. Good laundry tip. Lesson 1 of writing; never hit the delete button. Have you considered try to make this story into a children's book? Chris, ain't that the truth! Where do they go? Thanks for the read and comment. Glad you found it fun. If all my lost socks came back for a visit, I'd have to move out. This is truly one of the great mysteries of the world. Thanks for the fun story. At least these socks were clean. I'm not the world's best cartoonist, but if someone were to team up with me. My son was a great artist, too bad he's gone. I'll have to give it more serious thought. Thanks. I think this sounds like a perfect children's story! Why not? My son just got through reading one called "Sigfried's Smelly Socks." Let me know if you ever publish it as a book, please. 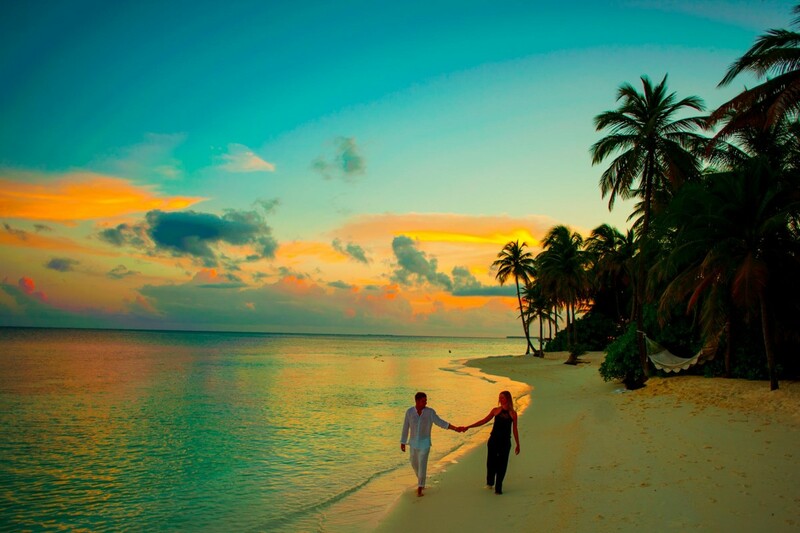 Zulma and Finn, just a quick thanks to you both for reading and commenting. It's about to storm here and I have to shut the computer down. I guess it's as good an explanation as any because I have never found some of them that were lost 25 years ago. Well, Kari, I didn't expect that. Maybe I should write an article on how to wash and put away socks. LOL As I said this was just a piece of nonsense that came to my mind. I don't expect it to win any accolades. Thanks. wow quite amusing....i was always curious as to what happened to those lost socks. This is adorable. Don't worry. Your secret is safe with me. LOL, I liked the explanation better than the story. I, too, hate those orphaned socks. The bags sound like a good idea. Manatita, sometimes I let my childish streak come through. glad you found it charming. I was afraid some might find it sacrilegious, but I knew the broad-minded wouldn't. Thanks, my friend. Larry, only coat hangers breed at my house. Maybe you are the culprit. Your middle name isn't Tompaul, is it? Thank you for reading and your funny comment, my friend. Jackie, when we used the old agitator washing machines, we used to speculate that they had gone under the agitator or over the top of the tub through the drain. I'm not sure that either is physically possible. I have a front loader now, so good socks going to heaven is my only excuse now. Mice chewed up three of my soft chenille sweaters for a bed in a drawer one year, but they left my socks alone. Glad you came back. Childlike and charming. Interesting piece. I suspect mice may be the culprit sometimes. Socks are so lightweight they don't have to chew it up and like the rest of us females they cut every corner they can. Glad I cam back for the rest of your story...and it does complete it! Venkatachari, I always wished that I'd had visitations from an invisible friend when I was a kid. I was able to kill two birds with one stone in this one. Thank you for reading and commenting. Hi, Bill, I appreciate your saving this until morning when you were awake. Didn't take you very long to read it, though, did it? I'll bet Bev has a few words to say about those orphaned socks, too. Happy cold Hump Day to you, too. It may get up to 30 degrees here today. Let's all pray for the early arrival of spring. Hi Flourish, we all know about those stubborn socks, don't we? I've found them hiding in pants legs, on skirt tails, and even on the floor behind the washer, but some I've never found. Those were usually my favorites, too. Thank you for reading and commenting on this dilemma. It's very interesting, MizB! A flash fiction with socks, that too orphaned! A great creation with the inclusion of two invisible spirits. Enjoyed it a lot. I love how your mind works, MizB! Very clever story, well-written, a great way to begin my day. In fact I saved it till this morning when I was awake enough to fully appreciate it. This was very clever, and I enjoyed it. Sometimes I actually find stray socks inside pant legs that are hanging up or fitted sheets. They hide because some of them are very averse to being stepped and sweated upon. Others are merely lazy or uppity about work. Hi, Jackie, I hit the publish button before I finished. You may want to read why I wrote this story. I do agree that it's hell not to be able to find the mate to my favorite socks, and sometimes I do have to give up and throw them out. Thank you for reading and commenting. Well MizB, sometimes I wonder where the go, but my guess would be in the other direction! I have their matches ready to throw out cause I give up looking!